If you are looking for a delicious treat to bring to a holiday get together, this is a great alternative to cookies. And it contains one of our favorite ingredients, Nutella Spread. Nutella is a hazelnut and chocolate spread that has acquired a huge (and growing) league of fans. My kids love this stuff! So today we decided instead of cookies, we would try making a Nutella cupcake, and this recipe turned out great. 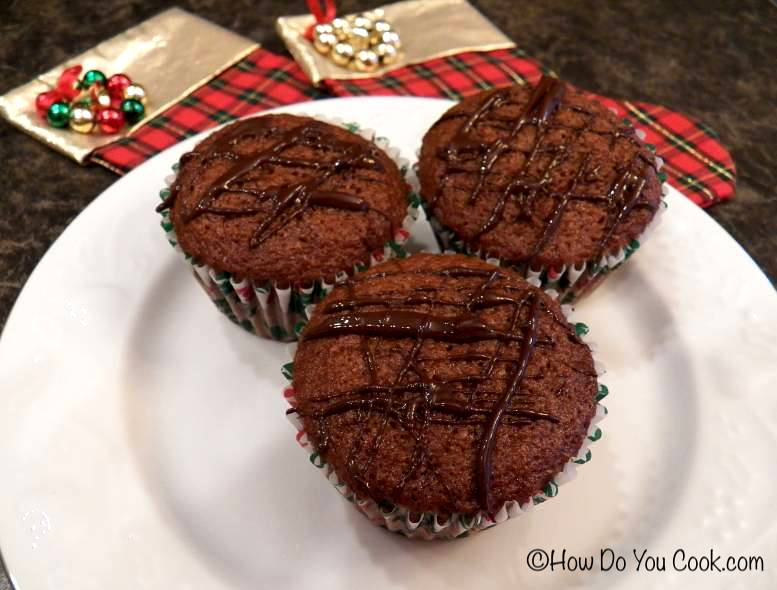 The cupcakes are moist and chocolatey, with the familiar hint of Nutella to accompany the chocolate. The final touch was a drizzle glaze of melted dark chocolate that we made using Hershey's Dark Chocolate Morsels. These cupcakes are so good, but I must warn you, they are a bit addictive! Enjoy!! Preheat oven to 350 degrees. Prepare cupcake pans with 21 liners and set aside. Cream butter with 1 cup of brown sugar and vanilla until smooth. Add Nutella and mix thoroughly. Add the eggs and mix until combined, then add the remaining brown sugar and blend well. Add the flour mixture and milk, alternating in small amounts, beating well after each addition. Pour about 1/4 cup of batter into each cupcake liner. Bake cupcakes 25 - 30 minutes or until set and a toothpick inserted in the center comes out clean. To prepare the drizzle - In a microwave safe cup combine the dark chocolate pieces and the shortening and microwave for 30 seconds. Stir and microwave for 10 seconds longer, if needed. When the chocolate is smooth, drizzle over the cupcakes.